If you love Mexican food, then this is the burger for you! I like variety and i like spicy. Every saturday i make a new burger with my airfryed french fries. I use to make meat stew, but since i like to eat vegetarian, this is a good alternative. There is nothing wrong with being vegetarian......actually it’s healthier for being a vegetarian i believe. Imagine that you eat food that is dead....Yuk! Then not to mention the bad fats, bad cholesterol, hormones and i’m convinced that you take the vibes of the animals you eat and we all know that most animals who go to the slaughter are not being treated well. I feel so sorry for those animals! I hardly ate meat in the last 2 years, just now and then....let’s say 2 times a month or so. Recently i went to the doctor to have a blood examination and it turned out fantastic. My sugar is optimal, cholesterol is "on point".....and that with hardly eating meat and just by healthy cooking and baking without sugar. With this message i want to say that i started being 100% vegetarian now after having seen on how people are treating animals who go to the slaughter. I have a conscious and i don’t want to be part of that + i became healthier by eating less meat anyway. Cheers to a Better Life! 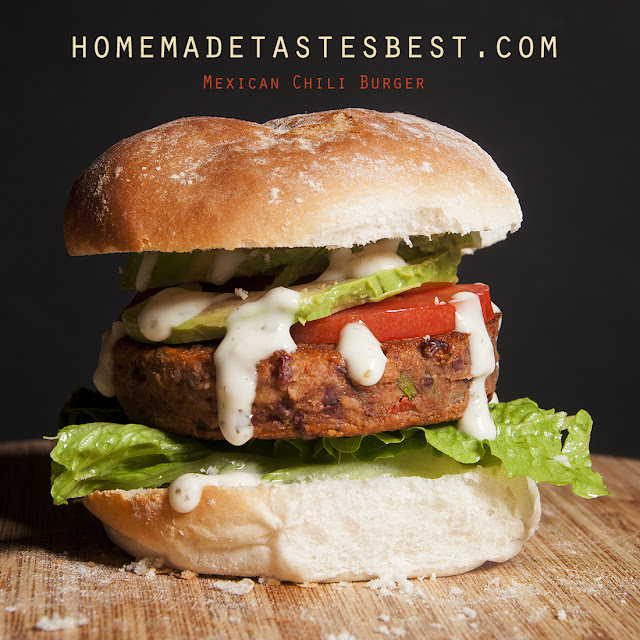 So, about this burger.......It’s simply delicious and you can make it as spicy as you like. For me 1 red pepper with seeds is just the right amount of spiciness. 2. Now heat up some olive oil in a deep pan or casserole and add the onion. Make it glaze and then add the garlic, chili pepper + red bell pepper. do not bake longer than 5 minutes on middle heat. You want to keep the taste of you ingredients. 3. Then add the can of tomatoes + 2 fresh ones you have chopped. Also add the Cumin seed, paprika powder, Oregano, cacao powder and salt. 4. Combine the Soy chunks in the tomato sauce and let simmer for about 10 minutes with lid on middle heat. The soy must be able to absorb the water of the tomatoes. 5. In a food processor or by hand with fork mash the kidney beans after you washed and drained them. Add the soy tomato sauce to it in a large bowl and also add the flour, chopped parsley and bread crumbs. Make sure you stir well with a wooden spoon to have a nice mass. 6. Put in the fridge for about 1 hour if you have time. Otherwise you can already start making your burgers, but it’s not a very steady mass. So you might be very gentle in making your burgers. I used a cheap burger press with parchment paper. That really helps. 7. Gently bake them in a pan on large heat first, so they get a nice crust. it will be easier to turn them over to bake the other side. Then lower the heat a bit, so they get baked inside too.